GOOD NIGHT AND GOOD MORNING!!! MORE GOODIES TO ADD TO *SPRING CELEBRATION* and I SCRAPPED!!! Man, oh man, where has the past week gone to? Seems like it was just LAST Monday! Hope y'all had a GRAND weekend and ENJOYED the "Trash-to-Treasure" hunt over at Digi Shop Talk!!! I told y'all some time ago that my slogan for this year (thus far) is, "I'm a day late, a dollar short and THE LAST to know"!!! I SO did not read or hear a peep about this FABULOUS treasure hunt providing TONS of GORGEOUS goodies from WELL-KNOWN and BELOVED designers! WOO HOO, there was some SERIOUS booty to be had y'all! AARGH .... AYE MATEYS!!! Treasure map and all - WAY too KEWL! So, where was I you are thinking? I'm not sure .... buried in Photoshop perhaps, tending to the family, catching up on e-mails and IM-ing with fellow designers!!! That is actually how I found out about the treasure hunt, but it was too late for me to find the time to participate. I finally went to visit my SWEET DIGI SCRAPS darlin', Liz, and saw her PRETTIES posted, so I snagged them, followed the enclosed clue and found a couple of others, but was SO tired I couldn't find the last two I was in search of, so I shut down all the Internet windows, opened Photoshop and SCRAPPED my little heart out until 3:00 am!!! I've had this photo for about a year now and have just been waiting for the opportunity to scrap it. It is a photo of my firstborn and first daughter, April Dawn and her LOVELY boss, Carolyn. I had the pleasure of meeting Carolyn and her husband while visiting my girls over the holidays and it is just SO comforting knowing that my baby girl (now 30!) has others supporting and watching out for her as she is SO far away from home (nearly 700 miles)!!! 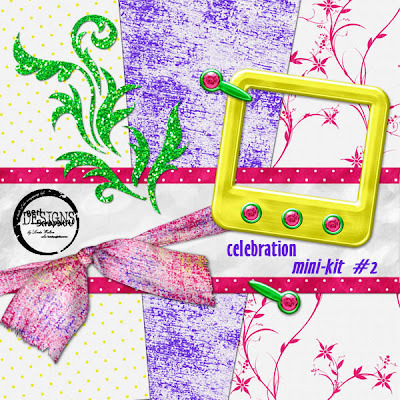 I am posting my layout below along with another little part for you to add to the *Spring Celebration Mini-Kit*. 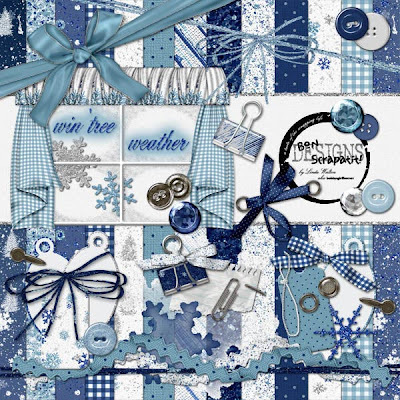 I will post later tonight about my *WIN'TREE WEATHER* kit and this week's "Crop 'em and Swap 'em" at 3Scrapateers hosted by our LOVELY Ms. Karen Halgren. If y'all have NEVER been to one, you just gotta join us if you wish to get some "winter" scrapping done quickly. Oh, and some more freebies!!! Until next we meet ... BON SCRAPATIT!!! 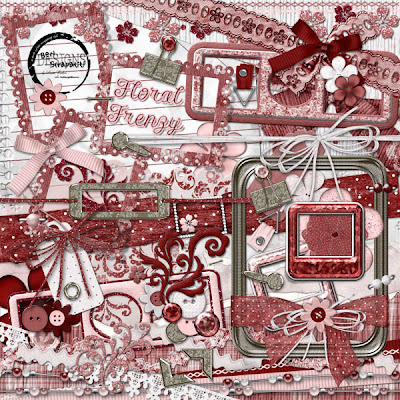 Layout created using, *Berry Ice* Mini from T2T by Sweet Digi Scraps. Photo courtesy of April Walton. WHERE WERE YOU 07/07/07??? COME SEE WHERE I WAS AND GRAB MY FREEBIE!!! It is AMAZING how many people were trying to book their weddings on July 7, 2007!!! Well, one of those lucky couples were our niece, Kimmi and her husband, Patrick as you will see below!!! I wasn't able to capture many shots of them walking down the aisle and standing at the alter due to the "professional" photographers and their positioning, however, I was SO happy to have captured the ones I did. These are just a few and the bride was simply STUNNING and the bridesmaids were wearing my second favorite color!!! I was not able go right to bed last night as I was HORRIBLY uncomfortable, so I sat here and tinkered around as my body would allow me and I actually scrapped!!! WOO HOO!!! 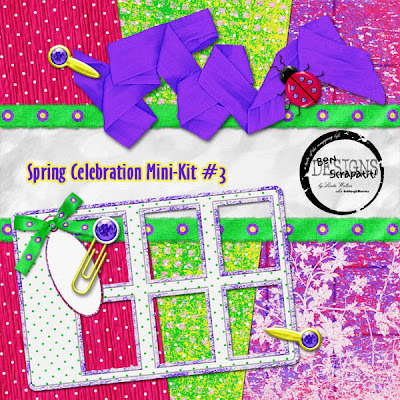 I wanted to play with some of the things I created for the *Spring Celebration Mini-Kit* and ended up creating a pretty nice "scrapatit" plus a couple of new items that you will get tomorrow night (ooops, did I say that???). 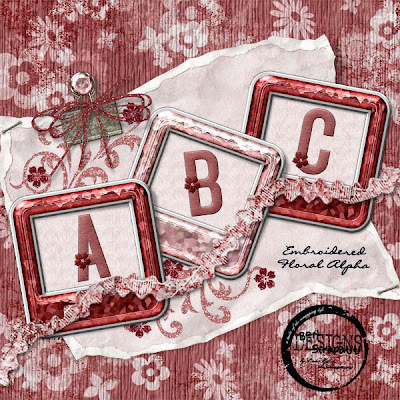 I just LOVE the multi-photo frame from a template by Catia' Cunha! I hope that y'all are having a MARVELOUS weekend thus far and have had QUALITY time with your families. With my boys all adults now and three out of four of them working, Robert and I actually get to enjoy a bit of quiet time together. Today, was a plumbing project that wound up to lead to more serious problems than we had anticipated. No worries, as we will inform our landlord and make a game plan! I 'd LOVE to hear some of the things that y'all do to relax on the weekends. I know that some of you may work, so if you are off during the week, I'd still like to hear how you unwind from your week, REFRESH and prepare to start it all over again!!! Carole love, I'm SO happy that you are doing SO much better and have a GOOD report from the doctor. I shall be calling you the beginning of the week. Tink, I'm REALLY feeling for you sweetie and I am hoping for you to be back on top in NO time. LOL! NO time. Just hit me what that means. Like, RIGHT NOW! I'm horribly behind with keeping up with y'all - PLEASE forgive me. I have LOTS of things going on and will be sharing with you, possibly, next week! Have a SUPER SUNDAY everyone and I'll see you tomorrow night with a few more goodies! 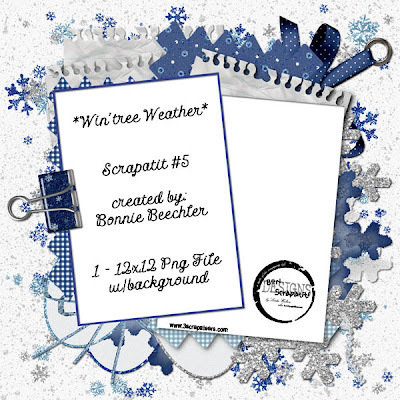 IT'S FANTABULOUS FREEBIE FRIDAY AT BON SCRAPATIT DESIGNS!!! I'm stopping by to wish y'all a MARVELOUS weekend and headed to bed!!! I think the week has caught up with me! Thank you to ALL who have replied here on my blog and those that have sent me e-mails regarding our situation with the boys. I GREATLY appreciate it and listening to the varied comments has helped me to relax and to fall back on what I know and that is that it will all work out as it should! I thank you for your prayers and support. Y'all are SO awesome!!! I'm not feeling so well at the moment - nothing serious, I just suffer from horrible digestive woes as I've mentioned in the past and am working to get myself back on the program that I need to adapt for life if I wish to FEEL good! And, I DO wish to ... grrrr ... sometimes things rear up at the most inopportune times, but I'm learning to listen!!! NEVER said I wasn't stubborn, but I eventually give in and DO what is necessary!!! I will probably miss Maria's AWESOME engine again due to my FTP needing to be updated and a few other minor issues. That is why I did not post last night and may not tomorrow night either until I'm caught up with the search engine! Sounds funny, but I've grasped a good understanding of how it works and I try not to let it miss anything so that everyone has a chance to snag the FREEBIE!!! By the way, I am now signed up with TECHNORATI, which you've most likely already seen over in my sidebar. Maria is using this as a rating system for our freebies and the more people that add us to their FAVES, the higher rating we get on the Digi Free site, which in turn probably means more people will visit our blogs and get to enjoy our freebies!!! So, if you happen to already belong, PLEASE add me to your faves if you drop by often and enjoy my designs. Also, make sure to drop me a note either by comment or e-mail so that I can add you to my faves as well!!! I shall surely appreciate all the help I can get!!! As more designers and freebie sites begin to list with Technorati, I will add them so that y'all can go right to the "blogroll" and connect to their sites from here! PRETTY COOL, eh??? I think so! Okay, I feel like I am about to burst (I am MEGA bloated) so I'd better leave you the FREEBIE and call it a night! Have a FABULOUS weekend and I hope that the weather is nice enough for MOST of you to go outside and enjoy nature!!! To those still getting ICE and SNOW - stay warm and I pray it all passes soon and you'll soon be feeling Spring coming on soon! 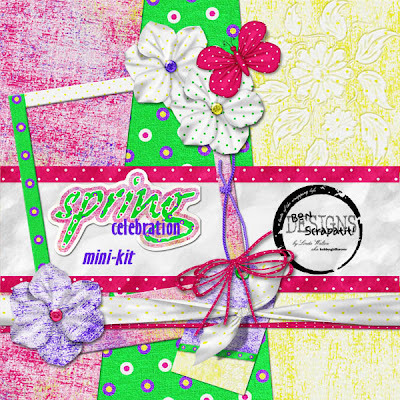 At least you can enjoy some of the AWESOME Spring kits that are making their debut!!! I just look at ALL of the LOVELY colors and designs and it WARMS me right up!!! We didn't make it out of the 40's today and I'm in California!!! COME CELEBRATE WITH ME!!! 100,000 VISITS TO MY BLOG SINCE OCTOBER 5TH! THANK YOU! WOWSERS!!! Am I in SHOCK! OVER 100,000 visits to my blog since October 5th!!! I thank you ALL so much for the OVERWHELMING love and support of Bon Scrapatit Designs! NEVER in my wildest did I EVER imagine myself to have the opportunity to reach SO many people SO far across the globe as I have - I am DEEPLY touched. It has been since I began to design, and still remains so today, my NUMBER ONE priority to allow ALL people EVERYWHERE the opportunity to preserve their family heritage via FREEBIES on my blog! My little gift today is simply the result of my playing around a bit VERY late last night while unwinding from the weekend. I will catch y'all up tomorrow on our experience with Cirque Du Soleil (AWESOME!) and why we ended up coming home WITHOUT the boys Saturday night (FRUSTRATING!). I needed to work with some fairly BRIGHT colors to perk me up and to prepare myself for working on SPRING designs!!! 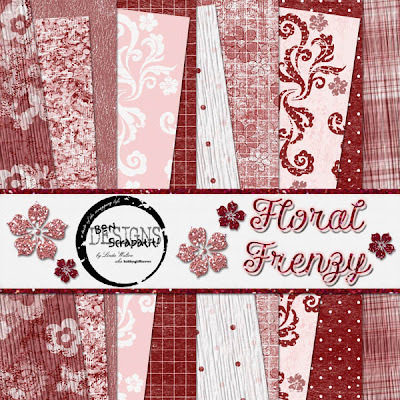 I will be revamping the second scrapkit I ever made as I ADORE the color palette and the patterns, but will spruce it up a bit as I have with *FLORAL FRENZY*!!! Just a few additions and minor changes and it will TRULY be *BLOOMIN' AWESOME*!!! 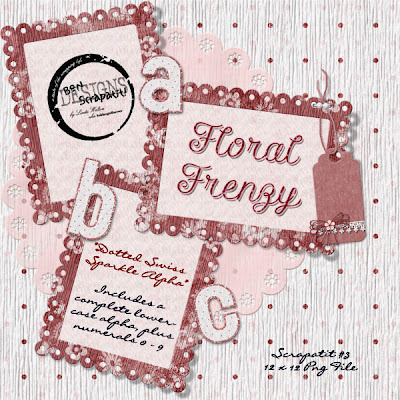 I hope y'all had a MOST productive scrappin' weekend and that you have enjoyed working with *FLORAL FRENZY*. For those of you who missed the 48-hour download of the entire scrapkit, I shall be adding it to my 3S store in the next few days and it will include both alphas I've given y'all thus far (these will be removed from my blog before the kit is live in the store) and I will be adding a THIRD alpha to it as well and ALL for a VERY low INTRO price. Stay-tuned for it's DEBUT announcement here on my blog! Here is to a PHENOMENAL week ahead for ALL of us!!! HAPPY VALENTINE'S DAY Y'ALL!!! HERE IS A SWEET LITTLE TREAT FOR MY DIGI-FRIENDS!!! WOW! What a day!!! A GRAND day indeed!!! Sent e-mails, talked on the phone with a VERY old friend I have not spoken with in a couple of years, worked on your TREAT, had dinner with MY valentines and worked on your treat a bit more and VOILA - here it be!!! I hope y'all like it! Scrapatit #3 is rather simple, but then y'all have ALL the pieces and can add your OWN touches or just leave it be!!! 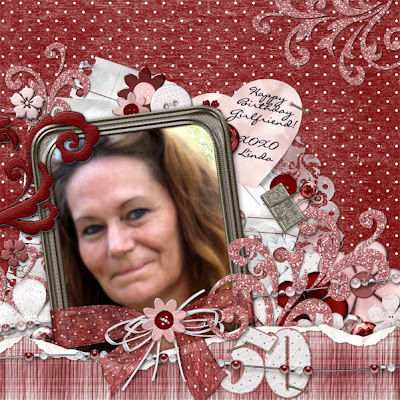 Ms. Jody, CONGRATULATIONS on being married "50" years girl - WOO HOO!!! You will notice that I have included with Scrapatit #3 a *Dotted Swiss Sparkle* alpha which includes a complete lower-case, a-z and numerals 0-9 per your little "hint, hint"! LOL! Gotta LOVE those hints ladies! I am thinking of creating a BURGUNDY embroidered alpha for tomorrow (embellished with embroidered flowers) - what do y'all think about that??? Hmmmm .... sound GOOD??? Yes, no, maybe so? ROFL! If I see enough hands raised out there early in the day, I shall make one for you, K? I hope that you all have ENJOYED your Valentine's Day today! To me, every day should be Valentine's Day and everyday should be like Christmas too!!! LOL! Well, we all might go broke for sure on that one though, eh? But you know what I mean - in our hearts. I think everyday should be filled with LOVE and a giving spirit should remain within us 365 days a year, 24/7! Enough said ... oh, whoops, TINK - you're gonna think me a BAD Momma!!! EEEEEEKS! I was SO busy working on the freebie today when Luke came in to share his "homemade" card with me, that all I could do was get teary-eyed when I read the poem that he had written for Tessa and to admire his hand-drawn hearts on a simple piece of paper. He decided late last night that HE wanted to create Tessa's card by himself and just wished to do it on a plain piece of computer paper as opposed to card stock and access to ALL of Mom's goodies!!! Luke is such a kind, thoughtful and generous young man - surely does this Momma's heart good considering all my boys have been through over the years! PHEW! I'll have to plead with him to have Tessa take a few snaps for me, preferably with her included!!! WHOA! Tomorrow is already FFF!!! Meet y'all back here tomorrow night for your FANTABULOUS FRIDAY FREEBIE, so make sure to hold your hands up high if you'd like that "embroidered alpha" tomorrow!!! P.S. I'd like to once again, thank EVERYONE for ALL of your wonderful comments and shares during my *FLORAL FRENZY* give-away!!! Y'all are SO sweet, encouraging and SUPER supportive, which is really worth SO much more than a simple "thank you"! I guess that is why I just keep on making goodies for you!!! Y'all ROCK ... and then SOME! MWAH! 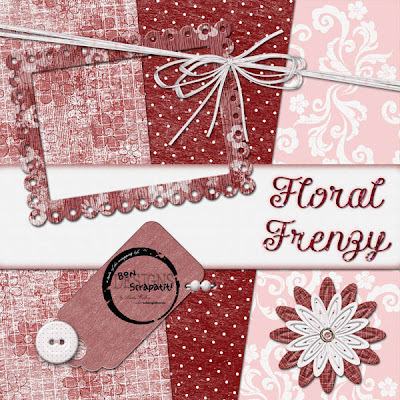 A LITTLE SOMETHING SPECIAL TO HELP YOU START YOUR SCRAPPING WITH *FLORAL FRENZY*!!! WOWEEEEEE GAZOWEEEEEE and OMGosh!!! I am SO "tickled pink" here that I've TURNED BLUE!!! 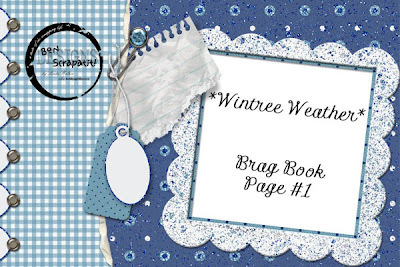 This last statement will ALL make sense to you tomorrow when I finally get *WIN'TREE WEATHER* fully functioning and ready for purchase in my store at 3Scrapateers!!! Nothing PINK in it FOR SURE!!! 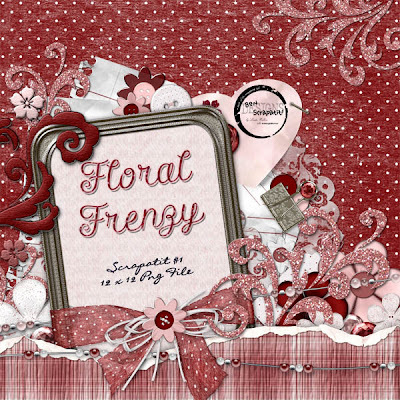 Thank you, thank you SO much once again for such an OVERWHELMING response to *FLORAL FRENZY*. Y'all just AMAZE me and I am continually learning that sometimes, just SOMETIMES, others will respond in a positive manner to something I think so-so! I really have not a clue why I have been "in the pink" for so long - just happened, but I had a REALLY good time with it all. SHEESH .... I've not even finished with *LOVE ACTUALLY* and have barely begun *CON TUTTO IL MIO CUORE*!!! But then ... SPRING is right around the corner and I will be working with some BRIGHTER colors! I had "unexpected" company EARLY this afternoon just as I was getting down to some serious business and rather than conduct business today, I had the HONOR of playing hostess to Poppa and Clint (Robert's dad and youngest brother) for the afternoon until Robert arrived home from work. I cooked and prepared dinner while they did their "guy" thing and then I politely excused myself to come in here and prepare tonight's freebie for ALL of you darlings!!! It was SO good having them here (they are spending the night and out playing cards as I type - they live about an hour and a half from us) and it's just been like "old times" before Poppa sold his house here in Copperopolis and has simplified his life so that he can now relax and TRULY enjoy it from here on out. 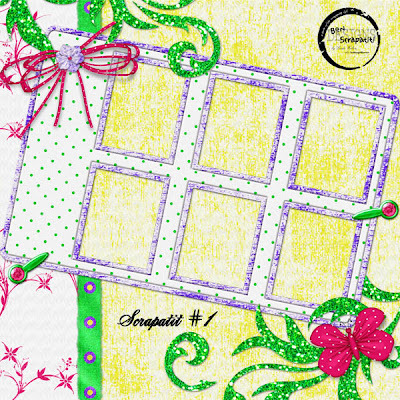 Okay, I think I've talked to your eyes long enough, I am leaving you with SCRAPATIT #1 and due to it's file size I shall post the separate frame and ribbon wrap for you tomorrow night so that you can overlap it like I have in the scrapatit. I will post Dawn's birthday layout here as soon as I get the finishing touches on it. Dawn is not real big on PINK or GLITTER, but when she receives the sentiment from me, I think it will make it more to her liking. I hope so anyhoo! Oh gosh, I KNOW it will!!! Have a TERRIFIC TUESDAY y'all and I'm looking forward to seeing MORE layouts coming in. I will address those of you who have already sent goodies to my inbox tomorrow. I've not had a moment to open any e-mails today so please forgive me for not mentioning anything tonight. I saw a few of the RE lines and just know that I am in for some WONDERFUL treats from y'all!!! THANK YOU, THANK YOU SO VERY MUCH!!! SWEET DREAMS and REMEMBER: It is SCRAP HAPPY HOUR in SCRAPLAND 24/7!!! ENJOY and scrap to your HEART'S content ... and then SOME!!! OMGOSH!!! CAN YOU BELIEVE IT??? THE FLOWERS ARE BEGINNING TO BLOOM OVER HERE AT BON SCRAPATIT DESIGNS!!! GET THOSE HARD DRIVES READY !!! I must be QUICK (ha, ha!) as I've kept you all QUITE long enough, however, I must tell you that I was kidnapped today and held hostage for a ransom!!! YES, I was kidnapped by my OWN brain and was not freed until I had produced what my brain said for me to!!! ROTFLMBO!!! Okay, I'm now awaiting men in little white coats to come and take me away ... he, he ... ha, ha!!! You MUST know that I've been working for HOURS on this and while I'm FULL of energy, I've been spinning my wheels FAR too long and need to switch gears for a bit, KWIM? LOL! Okay, I am going to be posting links for the BACKGROUND PAPERS while I am uploading the elements to my FTP. 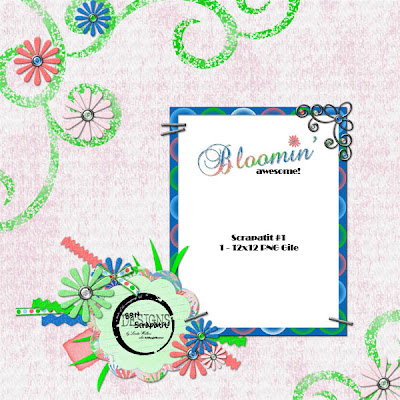 You will see images of both *FLORAL FRENZY* background papers and elements. You will know when the links are ready-to-go for the elements once you see that I have posted them beneath the links for the papers. My way of saying "THANK YOU" for supporting my designs, for putting a BIG SMILE on my face EACH day and for telling others about what I've been up to!!! THANK YOU SO MUCH for being Y'ALL and for ALL that YOU do to keep this WONDERFUL industry THRIVING!!! P.S. PLEASE, PLEASE post your layouts in the 3S gallery for me to see! (I will add a link to the sidebar after I finish uploading the rest of the files) It helps me to better construct my kits when I see what y'all do with them. In other words, when I view your MASTERPIECES, sometimes I get an afterthought of something that may have worked well to have been included! You may also e-mail your images to me, along with the inks to your gallery posts, and I would LOVE to include them in a slideshow as well!!! WOO HOO!!! I learned a lot today. I SO wish I had time to study tutorials myself, but for some reason I find myself exploring and figuring things out on my own. Maybe that is a GOOD thing for me to be able to pass something along to y'all. 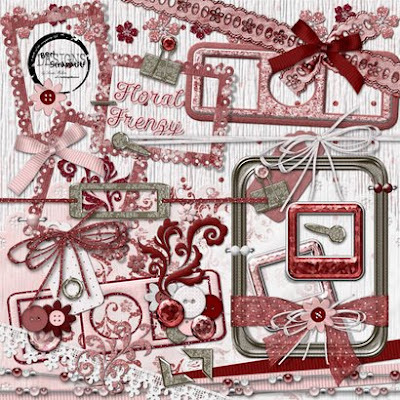 I will be putting together some tutorials for my DIGI-SCRAP ADDICT'S meetings from which I have taken a short hiatus! I can't wait to resume them and to see your SMILING faces once again!!! HUGS! COME SAMPLE A "SCRAPATIZER" OF WHAT'S COOKIN' AT BON SCRAPATIT DESIGNS FOR YOUR FABULOUS FRIDAY FREEBIE TOMORROW!!! Hi y'all!!! 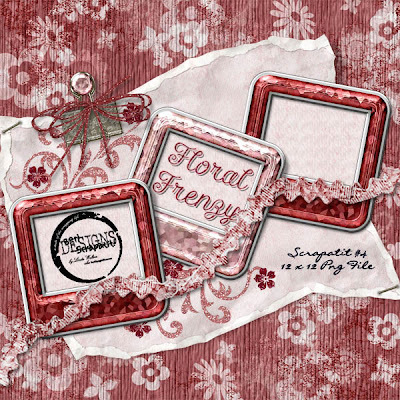 I'm HAPPY to report that I ACTUALLY was able to FOCUS today and have just the finishing touches to put onto *FLORAL FRENZY* and tomorrow's FFF will BLOSSOM on your hard drive while downloading!!! YES! I am treating y'all to links for 48 HOURS ONLY to this DELIGHTFUL little tidbit before uploading it to my 3Scrapateers' store!!! Hmmm ... I'm sure some of you might wonder why I seem to being doing this backwards, eh??? Like, why is she not putting it into the STORE first and then giving it as a FREEBIE once it is retired? Well, it's like this ... y'all have been SO faithful and I've just ADORED reading your comments each and every day, from answering my questions to sharing your day, telling me it's your birthday, anniversary and the list goes on! I would like to show y'all my SINCEREST appreciation for making this SO much FUN for me and a CHALLENGE TOO! I LOVE to be challenged (should have been my middle name me thinks!) and it rustles up my determination to learn and improve my skills. So with that said, "thank YOU" for visiting me my scrapping sisters and brothers (LOL - can't forget the guys .... we are getting more and more of them to come out and play in Scrapland!!!). Y'all are THE BEST and I THOROUGHLY enjoy EVERY moment spent creating for you AND corresponding with you, not to mention showcasing some of your BEAUTIFUL layouts in my slideshow at the bottom of my blog!!! And, PLEASE, dont think that just because the slideshow is at the BOTTOM of my blog that it is NOT important, quite the contrary, it is the ONLY place I can place it so that it is large enough to view your WONDERFUL details!!! Night all ... sweet dreams and I shall see you when??? TOMORROW!!! Which is??? FANTABULOUS FREEBIE FRIDAY!!! WOO HOOOOOOOOOOOOOOOOOOOO!!! DEJA VU??? NOT!!! IT'S SCRAPATIT #!, VERSION 2, LOL!!! Greetings everyone! I'm just dropping this off and then I'm headed to bed! My Monday did NOT go as smoothly as I'd hoped and I was HORRIBLY sidetracked, but for the better and I shall explain that, perhaps, tomorrow. The course my day took today will improve my work tomorrow, that's for sure!!! 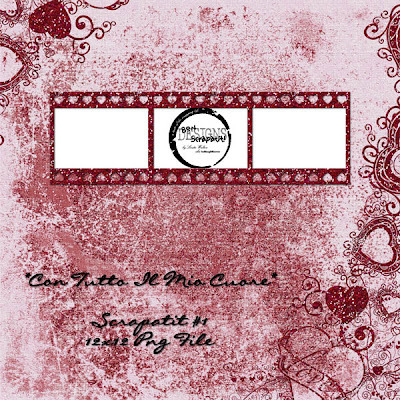 Anyhoo - Ms. Jody, here is *Con Tutto Il Mio Cuore*, Scrapatit #1, Version 2 (ala NO glitter) as per your request!!! I am sure there are MANY others who will appreciate the NO glitter look as well ... I hope! I don't mind altering things on occasion especially when it is not a time-consuming task. This was actually a bit of a challenge as I had not much time to work with and I wasn't quite sure how I wanted to approach the change right off the bat!!! I like the results and here I simply opened my PSD file, went to each glittered layer and removed the glitter style. I then used the select tool on my, now, black images to fill them with red, went to blending modes and selected linear burn and VOILA' - a different look! I actually recolored the film strip separately and in it's PNG file and then saved it as a new file before dragging it onto my canvas and applying the linear burn. I hope that perhaps my sharing these steps might help a few of you to learn a little something new! Photoshop is TRULY a joy to work in and it is REALLY amazing all it has awaiting our curiosity and desire to explore the world of digital photography, design and, OF COURSE, scrapbooking!!! Well, while MUAH sat here on her computer in between SCREAMS of "YEAH!!! ", "YEAH!!!" and "HELL YEAH!!! ", an AWESOME game was being played in the other room that only moved me from my seat for photo ops of the guys "being guys" and an occasional drink run for myself! Luke had to work, but Robert, Matt and John were here along with a few friends to enjoy what was to be an AMAZING Super Bowl game and according to my oldest son, Matt, the BEST game he has seen in years! I'm glad they all had such a good time and they were all WELL-BEHAVED and even cleaned up after themselves before everyone left for home at around 10:00! I was a HAPPY camper FOR SURE!!! Not a bad deal ... computer time and photo ops!!! How much better can it get than that? Okay, don't answer that!!! ROFL! Last night was anything but a FLY-BY as I rambled on so and y'all left me some NICE, LONG messages as well!!! THANK YOU! It was good to know that ALL is well out your way and Ms. Aly, I had EVERY intention of offering that layout from the beginnings of *CON TUTTO IL MIO CUORE (with all of my heart)* up as a "scrapatit" tonight!!! LOVED the tiny little hint - THANK YOU!!! Ms. Jody, I TOTALLY understand the "Plain Jane" style as I fight VERY hard against it at times myself!!! So in honor of your request, I shall offer up the same "scrapatit" tomorrow in a more simplistic fashion, a la NO glitter!!! Wishing y'all a FANTASTIC week upcoming and I'd LOVE to hear about anyone's SPECIAL plans for Valentine's Day, but ONLY if it is not a secret!!! I would not want to be the reason for someone finding out something that they should not, KWIM? ROFL! Been there, done that a time or two!!! I am diligently working on *LOVE ACTUALLY* and I should, hopefully, have it all together for y'all by tomorrow night lest something distract me horribly! So, here's hoping for a SMOOTH Monday on my end! Take care and remember ... it's SCRAP HAPPY HOUR 24/7 in "Scrapland"!!! FLY-BY FREEBIE TIME!!! WOO HOO, I'M ALIVE ... I'M ALIVE!!! Okay, I apologize for being MIA and not letting y'all know that everything is okay!!! How rude of me and I shall try not to do that again, but y'all know how LIFE just seems to be FULL of surprises every now and then!!! I've been playing DOMESTIC GODDESS the past few days and have TOTALLY devoted ALL of my time to my PRECIOUS family! I actually went grocery shopping Friday evening!!! Robert picked me up after work and we spent nearly two hours in our local IGA supermarket!!! Hey, I don't get out much and when I do, I always bump into a few people that I've not seen for NEARLY ever! Once home, I spent almost as long in the kitchen putting groceries away as I did in the store selecting them!!! OMGosh!!! Well, needless to say, the boys were are RELIEVED to see that the FOOD FAIRY had stocked the refrigerator and cupboards for them upon their arrival home from Friday night FUN and work!!! One of these days they will ALL understand what it REALLY takes to keep them well-stocked in goodies for the tum-tum!!! ROFL! Tis NO fairy involved - it's called hard work and money!!! Hmmm ... well, Robert works hard, I consider my work to be FUN for the most part!!! I missed FANTABULOUS FREEBIE FRIDAY and am leaving you with a FLY-BY FREEBIE tonight as I am just now getting some computer time since leaving for the store on Friday. Friday night is our "date night" in the living room watching movies, however, we spent today watching movies together since groceries commanded several hours of our time on Friday and we had the house to ourselves most of the day!!! LOL! It's also been rainy and cold so snuggling out by the fire was just what the doctor ordered! I hope you enjoy the SECOND alpha that coordinates with the upcoming *LOVE ACTUALLY*!!! 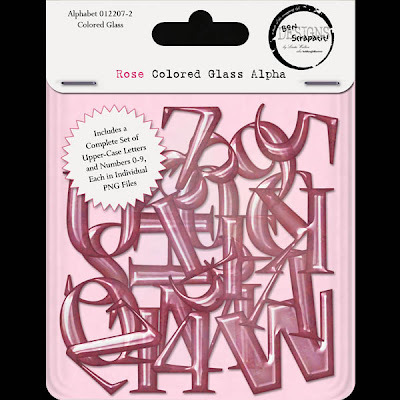 This one is a ROSE-COLORED GLASS ALPHA and will work wonderfully with just about ANY kit that has a pinkish palette going on. I'm still struggling with *LOVE ACTUALLY* a wee bit and just had to back away from it a bit to get a fresh perspective and I started playing with some new brushes I snagged some time ago along with some filters I have. WOO HOO - I had some FUN!!! Below is a preview of the first paper I've made and this is going to be part of a little mini-kit that I'll be putting up for y'all just as soon as I'm finished (not part of "Love Actually"). 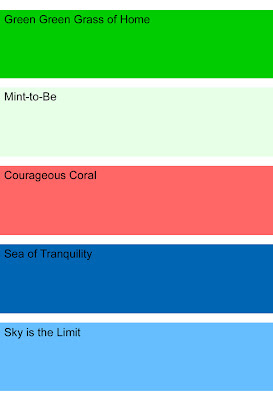 I'm making all of my own patterns for my papers and I've even created my own template for a SPECIAL film strip. Below you will find a SNEAK-PEEK at my first paper and one of the GLITTERED film strips. Y'all may have seen a film strip like mine around somewhere before, but these eyes haven't so it's NEW to ME! I just don't get much time to go out kit shopping these days so as you've heard me say before, I'm usually "a day late, a dollar short and the LAST to know"!!! Hope y'all are having a FABULOUS weekend and for those of you who have men at home that will be watching the Super Bowl game tomorrow, may you take this time (that is if YOU aren't watching the game too!) to get some scrapping done!!! for this coming July and I am SO excited for the both of them! a first-time "auntie" to Mark's firstborn son!